the graphs need to be normalized to current total volume, as a percent of total volume, not absolute numbers. otherwise they give a false indicator. Irregularly updated: the monthly Fram export graphs. The low volume numbers of late do not seem to be caused by higher than usual Fram exports. Since these graphs are based on average monthly thickness and velocity numbers, I have some doubts about their validity. Daily numbers are available now, at some time I intend to uses these. Just, wow, Wip. Fall 2016 through now shows a very delayed Fram export curve. However, the Arctic Oscillation has been cyclonic, favoring export. That leads me to conclude, based also on observations of it happening, that ice melted out before it ever got to the Fram. It was exported as fresh water. Remember: during most of the NH autumn and winter, much of the ice heading towards the Fram melted before it got there! I like the export graphs though, really top notch and worth peer review in my book. just saying that for a year on year predictive value it would be better to have it graphed as a percent of total current volume. I believe that this would show this year being slightly higher than previous years. I believe that this would show this year being slightly higher than previous years. Latest daily volume numbers file while official site is not providing it. Edit. Sorry should have said nothing new in here, really just making available for PaulS at stoat's site who couldn't get at data from psc site and still seems to be unavailable from there. Same file cleaned up in Google Sheets and re-exported as CSV. (It is a .CSV file, but I could not upload that type so I renamed it as txt.) No idea what I am going to do with it now that I have it, but I figured it would be an easier format for many to deal with. As an aside, I know it is an artifact of the decimal system and the units of measurement but the way vol under 10 showed up as a new column I had to clean up and then increased in size was striking. The last update is for Feb. 28th in this file, which we have already. P.S. I would make an educated guess that PIOMAS is around 20.5k km3 right now and currently dropping. They didn't update the thumbnail, I've been staring at it all day! Average thickness chart looks a little troubling. The X axis starting before January really throws me off with these graphs, is the graphed data through the middle of March or all of March? Interesting that Beaufort Sea depicts some thicker ice than usual. And the thick ice blob that is close to Fram.... It is a miracle if it manages to stay in the Arctic through the melting season. Who would have thunk it. I was a little too high on my guess. Thanks, Zach. 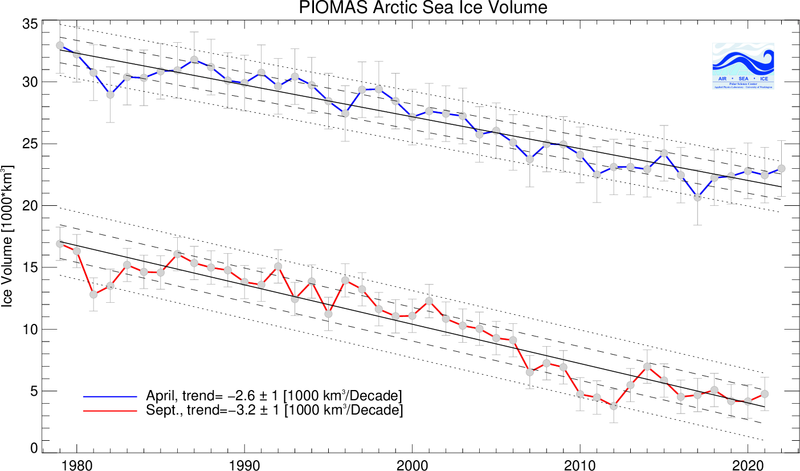 Your first animation of March sea ice decline is disturbing. The thickest ice is piling up on the way out the Fram strait. This is a catastrophe in the making. The atmosphere is also switching to summer mode as the stratospheric polar vortex goes into it's final warming for the spring and high pressure sets up over the Beaufort for the coming weeks. We're going to see rapid ice loss in the Beaufort as warm high pressure and intense sun heat the atmosphere. The X axis starts at the befginning of January and provides the daily data. The marked points (Jan, Feb, Mar) are the monthly averages. Really troubling. The energy required for a meltout is at reach of the two or three worst summers in the last ten years, not just 2012. A 2007-like might end it too, the '15 and '16 summers also saw a strong volume decline. But small details count, early cracks, warm spells, ocean currents... sun or storms? Can amplify the heat or mitigate the feedbacks. Another gloomy start of the melting season. Indeed! A simple drag and drop of previous years shows the potential for a far-too-close-for comfort minimum. That smells like a Blue Ocean Event. Indeed. No prediction of Blue Ocean here until after I see the numbers at the end of May. Far too much depends on weather and albedo. ...and assuming 2017 Max Volume is as of today, then a 2012 melt will see intrepid explorers having to search far and wide for any ice at all, at all, to go with their Scotch. Attached my year-by-year anomaly graph showing the strong negative anomaly changed little in March. Gridded thickness updated as well. Here is the animation for March. End-March volume. The thickening Beaufort and CAB couldn't offset the blob heading into the Fram, and the 6-year "plateau" waved goodbye. Export in the near future seems like it is going to not only take a bite out of the volume directly, but will soon start to make way for a lot of km2's of open water ready to absorb energy, and early on in the season at that. Momentum being key. So, whether predictions are in order or not, the situation certainly calls for grave concern. There may be some serious teleconnection problems coming our way. I have posted the latest PIOMAS update on the ASIB. The average of all those potential maximums for 2017 is 20795 km3. Now, the average of total melt for the past 10 years is 18269 km3, which means that at the end of this year's melting season the minimum could be only 2526 km3 (the lowest minimum on record reached in 2012 was 3673 km3). If we take the lowest amount of volume growth since the end of March (2007), and subtract the highest total melt (19693 km3 in 2010) from that potential maximum, the minimum could even go lower than 1 million km3! But that's just numbers. Even though it shows the theoretically possible, we'll have to wait and see what the weather brings this melting season. Suffice to say that it would take some crazy circumstances for this theoretical extreme to become practice. Whether a blue ocean event is reached or not, our civilization shouldn't have exposed itself to this risk. Just using the 2017 Max based on 2016......produces a 8.5% drop from the 2016 max. THAT....is good chunk of ice. And this second shows where 2017 volume might end up if it were to follow the trajectories of the other years in the record. There are no "blue ocean" events on tap, but following 2010's behavior the rest of the way, for instance, would render a minimum of under 1,000 km3. In fact, a repeat of the 07-16 average would keep 2017 below the 2012 record for nearly two full months, and wind up with about 2,300 km3. The March 31 thickness map, compared with previous years and the thickness-differences. Neven - thanks for another interesting monthly update (and the hat tip ). Just note the typo - "the minimum could even go lower than 1 million km3" should be 1000 km3 of course. God, I'm so stupid. Thanks, oren. And thanks for the graph. 1 million km3 is a lot, about enough to cover the entire surface of the planet in nearly two meters (6'5") of ice. Gee, You are dam' selfish. Thanks for the update Wipneus, much appreciated. Those year-to-year differences maps for 31 March are telling: the ice appears in worse shape this year than in any of the previous years shown, apart from that blob of thick ice poised over Fram Strait. If one compares the March volume with the linear trend, one could say that volume reduction is about 4 years ahead of schedule. This points more to accelerated slow transition rather than imminent collapse ? Its not even a one-off. The anomaly is now about 1 STD below trend which is low but not spectacularly so. 2007 and 2011 were in a similar place. There were records then and I expect there will be record minimums this year, but 1 STD below trend is no evidence at all of acceleration in trend. My simple (and not scientifically trained mind) tells me the remaining ice volume will disappear much more quickly than many people suspect. Things like "storms" have got to be pretty tough to "model". Remember.....the models 5 years ago said not to worry until 2050 - 2100. I wouldn't be surprised to see something in the range of 3,000 KM3 this year OR LOWER.. (where that "black dot" is in September). The only significant MYI is along the coast of the Canadian Archipelago. Ice is now more and more susceptible to weather, currents, storms....etc. And "ill timed storm"....and there goes a lot of ice. I think we will get to THIS YEAR....where I "thought" me might get LAST YEAR. And that is the only significant ice is north of the Canadian Archipelago going east to the northern Greenland shores.. By 2020 or 2021.....almost entirely BLUE WATER in the Arctic in September. Just to be clear, the "slow transition" theory postulated that summer sea ice in the arctic will slowly transition to a seasonally ice-free state instead of a tipping point and immediate collapse - this due to a plateau in winter sea ice after the MYI has largely gone and thanks to almost-constant FDDs. The plateau held for a few years, but the FDD assumption proved incorrect in reality and the plateau was broken cleanly this year. Will FDDs continue to exhibit such large anomalies, or is this a one-time outlier? Good question. I suspect the FDD deficit is systemic and partly a result of feedback from the enthalpy accumulated in the previous melting season, and therefore that the slow transition claim is invalid. On the other hand, I agree winter volume is showing a linear trend with no acceleration. Just to be clear, the "slow transition" theory postulated ... this due to a plateau in winter sea ice after the MYI has largely gone and thanks to almost-constant FDDs. Not sure I quite agree with that. I thought slow transition allowed for continuing slow decline in FDD due to increasing GHGs and increase heat transport from lower latitudes. This would lead to slow decline in thermodynamic max thickness and therefore maximum volume continues to decline but at a slower rate rather than the fast volume decline when thick MYI was rapidly being replaced by thinner FYI. This would make the deviation in max volume from expected slow transition trend larger than 1SD which is nothing unusual at all to something larger but I think it is still well within realms of possibility and thus not ruled out. The off trend decline in max volume is caused by off trend FDD number. So rather than calculating how far off max volume is (awkward with changing trend), perhaps it is more relevant to ask how far off trend is the FDD number? If we have a look at the PIOMASS figure below, I don't think there is. From 2007 onwards, nearly every year is dead on or below the linear trend of -2.6 [1.000km³/decade] for the April volume - only exception 2014. From Nevens blog post I gather that 2017 will most likely come in below 21.000 km³, which would again fall below the trend line (perhaps an outlier like 2007). I am not arguing that there is an acceleration. But neither do I see any slowdown. What am I missing?